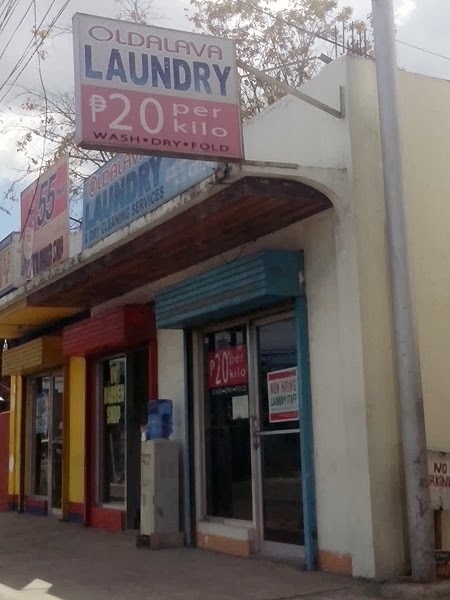 Who wants to do oldalaundry? What's on the menu? Chicken wings, chicken wings, chicken wings. 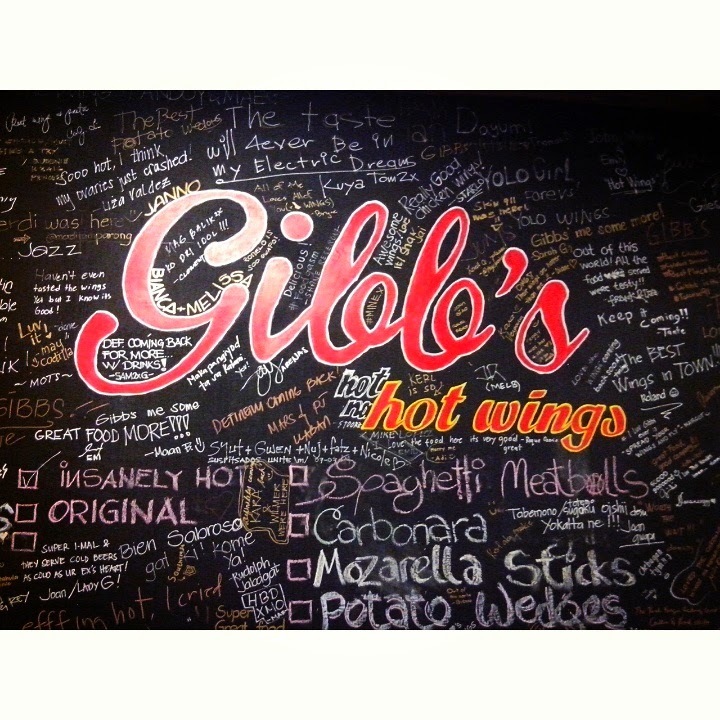 Chickens rejoice when they hear you order Gibbs' non-chicken-wing items: pasta, potatoes, mozzarella sticks, beer. 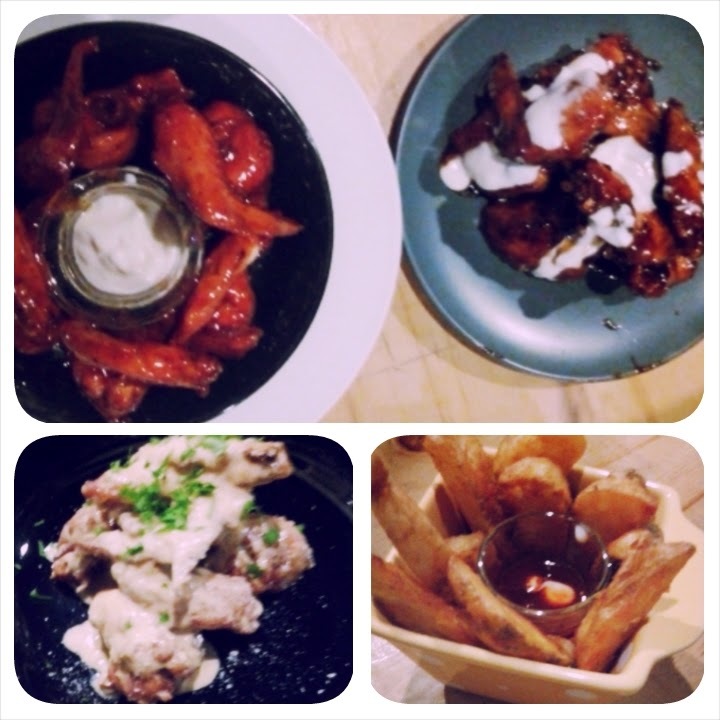 Clockwise from top left: hot wings, spicy honey garlic wings, potato wedges, angel wings. * Hot Wings (Php 175). There are five levels of hotness to choose from and we picked level 3. If we had picked level 5, I think we'd need a crate of beer each. * Spicy Honey Garlic Wings (Php 195). Name says it all. Spicy. Honey. Garlic. * Angel Wings (Php 205). Wings with cream, cheese, and garlic sauce, topped with Parmesan cheese. * Potato Wedges (Php 75). Served with sweet and spicy dip. 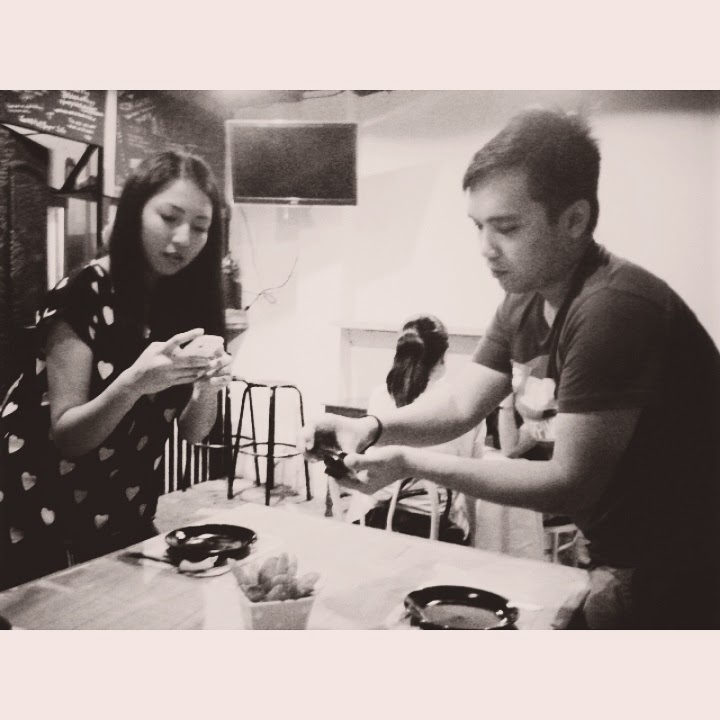 * And a pitcher of Gibbs' house blend juice (Php 125) for our smoldering tongues. If we, pigs, could fly, we'd prefer our wings hot or spicy honey and garlic. Angel wings we can do without. Being such gluttons, we wouldn't be admitted into heaven anyway. Bring some Good Company for a feast of Good Food. Please read again and sing to the tune of Brick by Ben Folds Five. I got invited to the day–before–opening–day event. 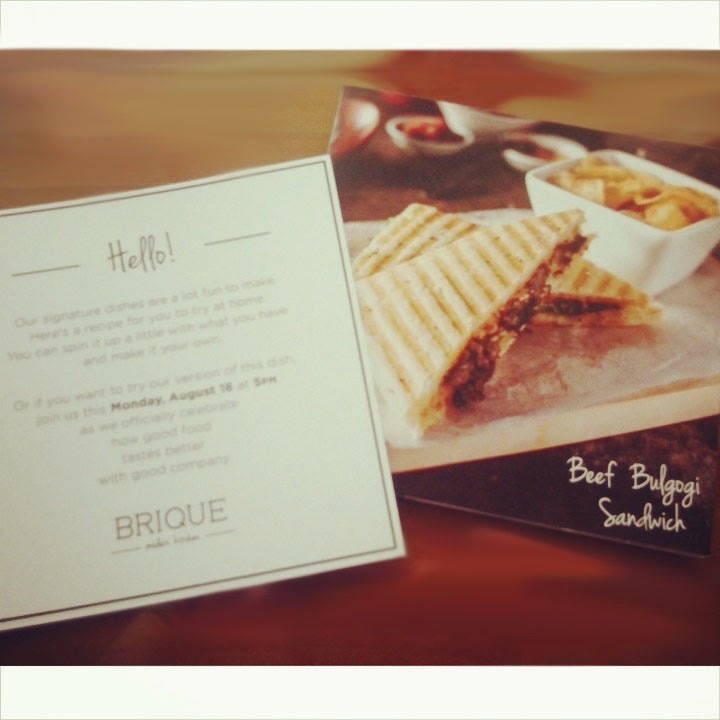 (The invitation made me think Brique was a sandwich shop.) The event was on a Monday and I was running an hour late. When I got to Brique, everyone was already enjoying their food. The server handed me a menu and I was surprised by the options: Brique was more than just a sandwich shop. I took my two friends' advice and we had the smoked fish dip (Php 140), truffled shoestring potatoes (Php 250), fish provencal (Php 260), and bibingka creme brulee (Php 60). I liked the food, especially the truffled shoestring potatoes with sriracha mayo, fish provencal, and bibingka creme brulee. Mozzarella is my favorite cheese so the smoked fish dip was good enough for me. Companions also ordered the squash and carrot soup (Php 140), Arabian salad (Php 275), drunken angus (Php 370), salted caramel chocolate cake (Php 90), and veggie garden juice (Php 90). The starters and salads were good for three to four persons. Soup for one, if really hungry; two, if feeling generous. Entrees and desserts were good for one. The soup and salad were good, though nothing fancy. My friend was raving about the drunken angus. I found the salted caramel of the chocolate cake too salty. The celery in the veggie garden juice was too strong for my taste. All in all, Brique is a good place for a good meal with good company. 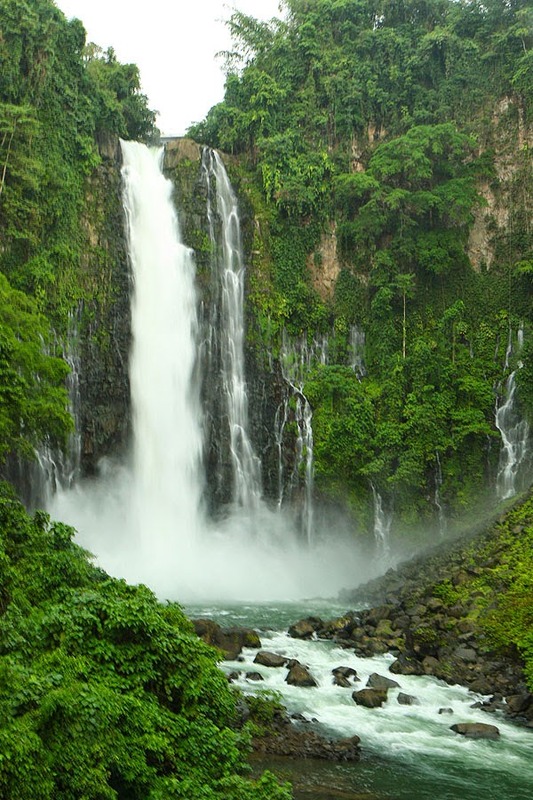 Maria Cristina Falls is so powerful that as I stand on the viewdeck of the hydroelectric plant fronting this 98-meter waterfall, I see billows of mist, even with just one of its drops flowing (on weekends, both drops come rushing down full force at 11AM). The mist reaches me....or maybe it's just the rain. But, believe me, it is very powerful—it provides a large chunk of Mindanao's electricity. I was in the mood to be a nerd that day and would have loved to have a tour of the power plant, but time was limited and, besides, I think a request for a tour would have to be arranged in advance. 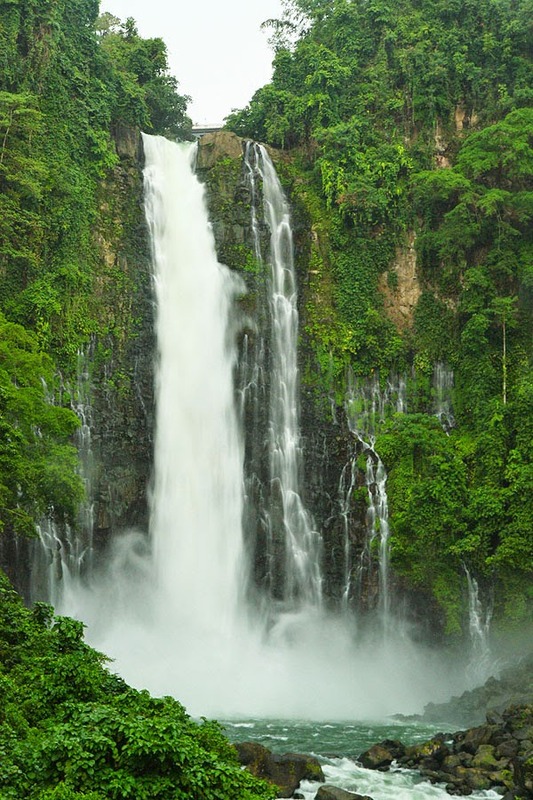 Maria Cristina Falls is located within Iligan City's National Power Corporation (NPC) Nature's Park, just 9.3 kilometers from the city center. 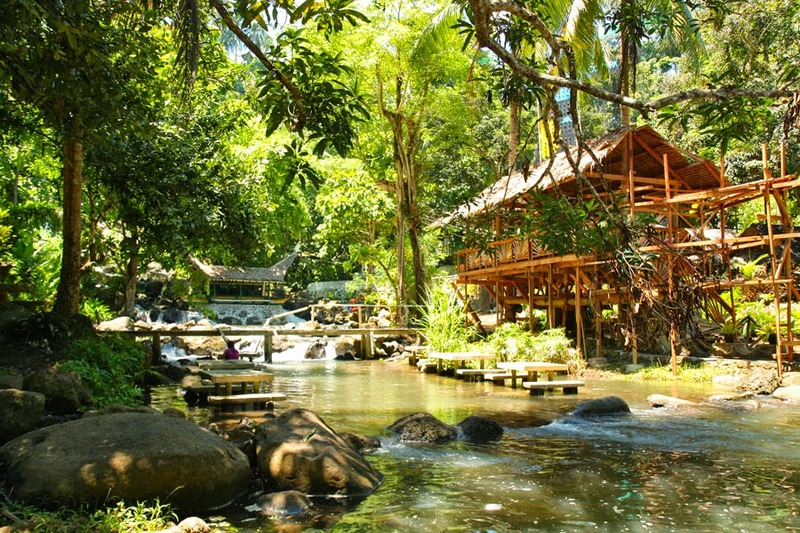 NPC Nature's Park can be reached by taking a jeepney bound for Buru-un (fare is Php 11). Be alarmed. Mimbalot Falls has disappeared. Obscured by development in the form of Paradise Resort and Eco Park. Look beyond the eyesore to see the 90–ft. beauty of Mimbalot Falls. take the little path on the left. then you might have to pay that entrance fee after all. 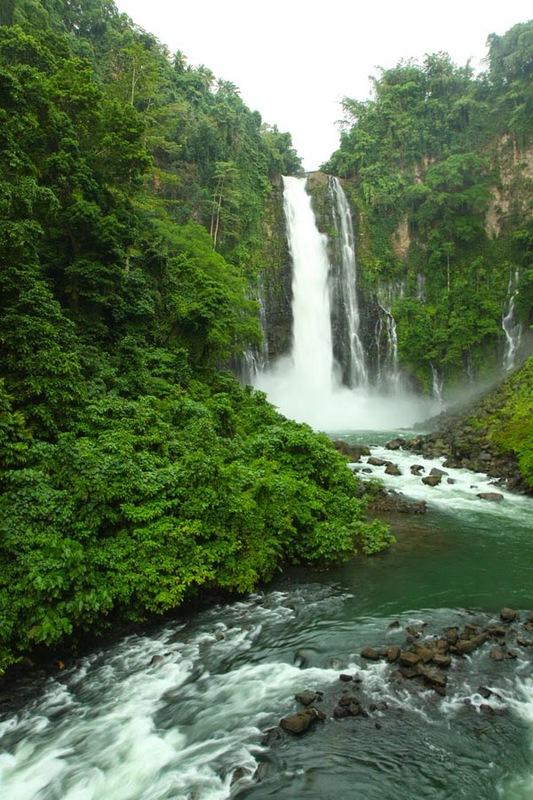 Mimbalot Falls is in Barangay Buruun, 11 km from the city proper of Iligan. 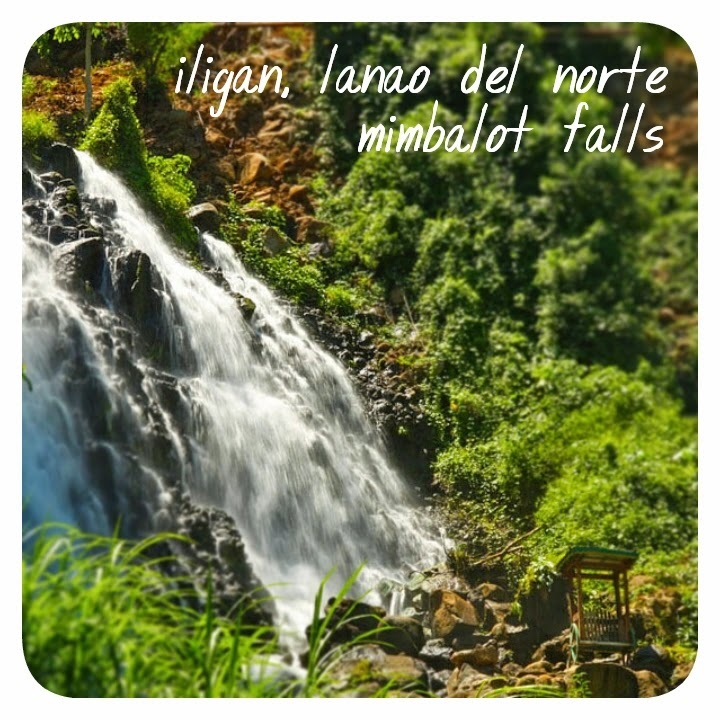 For directions on how to get to Mimbalot Falls, please visit Pinay Travelista's blogpost. Nice and sunny. That's what I woke up to while aboard Trans–Asia approaching Cagayan de Oro. Nice and sunny on the road to Iligan City from Cagayan de Oro City on a Super Five bus (Php 85, travel time of 2 hours; buses leave every 20 minutes starting 4AM with the last trip at 1045PM from Sunday to Thursday and 1245AM on Friday and Saturday). Nice and sunny as I dumped my bags in Jasmine Pensionne House. Nice and sunny when I entered Jacko's Kan-anan with the members of Iligan Bloggers Society and the participants of the Waterfalling Adventure Tour (WAT). Nice and sunny. Is what we were all expecting the afternoon we were to go to Dodiongan Falls, the first waterfall on this waterfall–choked 3–day itinerary. Gray and drizzling as the old white van we were in navigated the road to Dodiongan Falls. Gray and drizzling as we bumped along the uneven dirt road to the jump off for the 20–minute easy hike to Dodiongan Falls. Gray and drizzling as we trudged over rocks and grass. Gray and drizzling as we crossed the river twice. 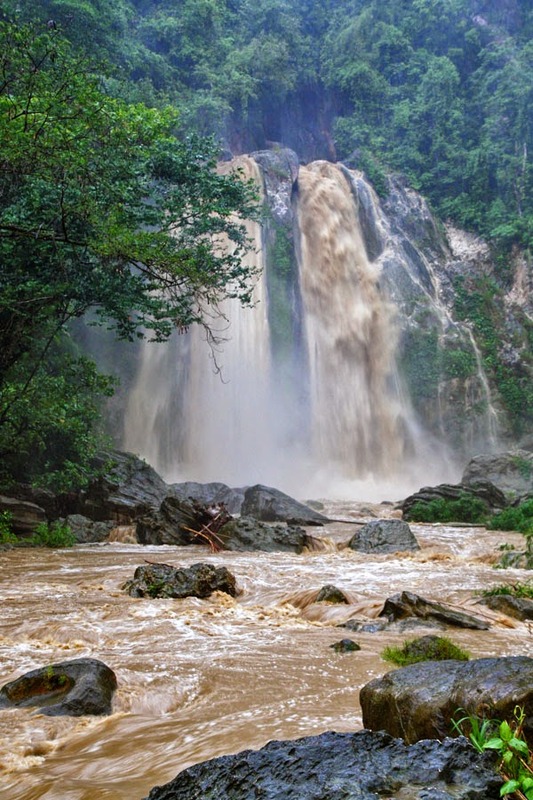 Brown and raging, the state of Dodiongan Falls was when we reached it after what seemed like more than 20 minutes. Brown and raging it stayed while we took turns taking photographs of Dodiongan Falls under the shelter of somebody's umbrella. Brown and raging still when we heard a lady call to his son, who had been leading our way, to come back. Brown and raging it persisted so we decided to turn back. Steady and pouring, the rain was as we slowly traced our way back. Steady and pouring, the rain made the river swell. Rushing and rising, the river swallowed up the trail we had taken just a few minutes ago. Rushing and rising, the river widened and we carefully clung to rocks and plants in the hopes of not falling into the river. Rushing and rising, the river had risen to impassable depths and forced us to take another way up and down the side of the mountain, making the 20–minute easy hike into a 40-minute workout. Soaked but happy, we all were. To have come back safe. To have seen Dodiongan Falls. 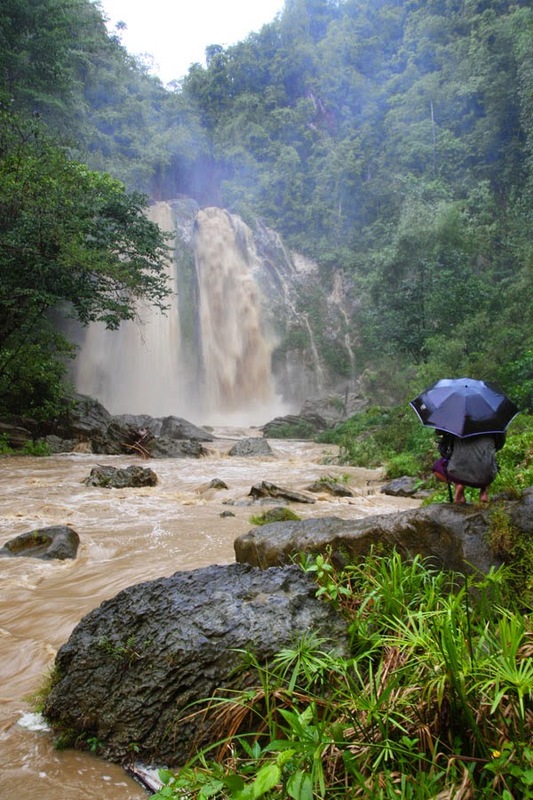 Dodiongan Falls is in Barangay Bonbonon, 14.5 km from the city proper of Iligan. 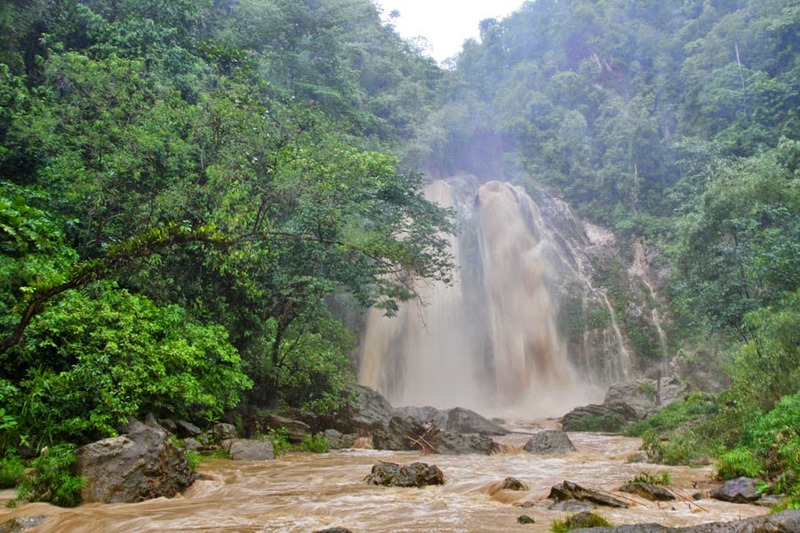 For directions on how to get to Dodiongan Falls, please visit Pinay Travelista's blogpost. Iligan Bloggers Society, Inc., the people who caused me to expose my bald head after I met them, sure thought of everything for the Waterfalling Adventure Tour (WAT). Including food. They made sure the waterfall chasers wouldn't starve before, during, and after the chasing. 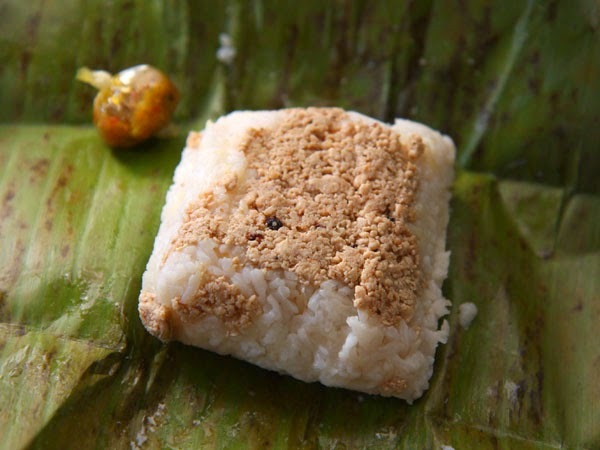 Rice topped with shredded meat (chicken, beef, or tuna) wrapped in banana leaf, add a bit of palapa, and I have a tasty, spicy breakfast for just Php 25. I just wish it had more meat. Warning: Use palapa sparingly, unless you have a fire extinguisher handy. A huge lunch in preparation for the 20-minute easy hike to Dodiongan Falls? Jacko's Kan-anan generously prepared a feast of vegetables, meat, and seafood, subconsciously knowing the participants, right after lunch, wouldn't be merrily skipping over grass and rocks to get to (and from) Dodiongan Falls. The grill of tatay must have been busy that night that only one grilled item was served for dinner and the rest were cooked off the grill. But no one complained. The food was good and the seafood fresh. Lucky for me, I picked the right seat—right in front of the seafood tinola and adobong bihod (Tatay's specialty). The group recalled their days of adventure over coffee, desserts, and laughter at Brews Almighty. The recommended nightcap? Durian cappuccino (Php 100)—coffee that not only smelled faintly of durian but had bits of durian in it—paired with suman with latik (Php 20). don't forget to bring snacks. We all know inflight food and drinks are expensive. And flying on a budget airline means no free snacks. So, I repeat, bring lots of money if you are willing to spend 100 pesos for a cup of instant noodles or bring your own snack stash. And, even if you have a lot of money, it is still better to bring a snack stash (but there are airlines that prohibit passengers from consuming food not bought from the flight, so eat your stash in secret). Especially if your flight is hours long and happens over meal time. 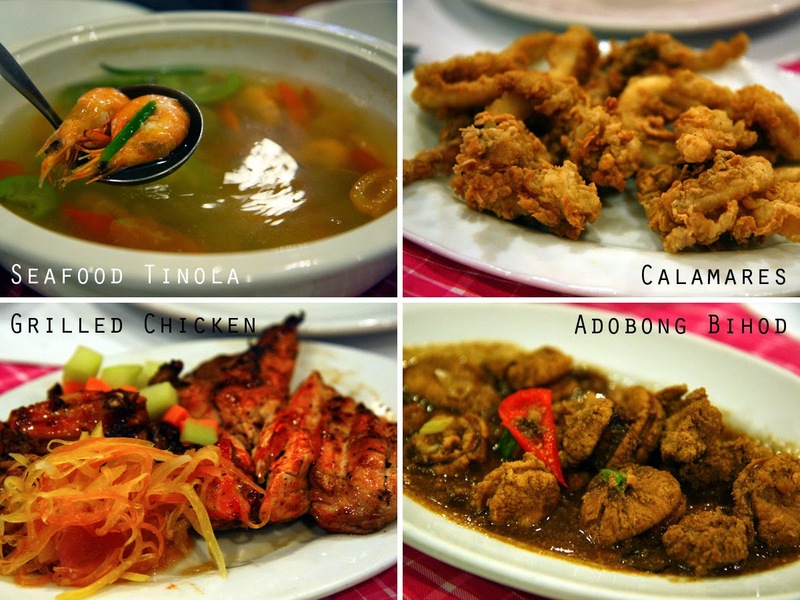 On a four–hour flight, I was so hungry I was willing to spend 200 pesos for a meal. I had my money out, but they had run out of rice meals (third lesson: pre-order your meal through the airline's website). I had to dig through my pasalubong bag (sorry, pasalubong recipient) or else let everyone in the plane suffer the rumblings of my stomach.